Languages: French; many also speak English and a smaller number speak German. Passport/Visa Requirements: Passports are required of Australian, Canadian, U.K. and U.S. citizens. U.S., Canadian and Australian citizens may stay up to 90 days without obtaining a visa. Predominant Religions: Christian (Roman Catholic, Protestant) and growing Muslim and Jewish populations. Safe, quiet, a bit sedate – Geneva may seem more like a place to do business than a place to take a holiday. But stop and explore a while, and you’ll discover the many charms of this cosmopolitan city and its surroundings. With its dramatic lakeside location, ringed by mountains, Geneva begs you to get out and enjoy the fresh alpine air, take a boat across the lake’s sparkling waters or tour the quaint towns and villages that dot the shore. I went to graduate school in Geneva, and lived on a shoestring. Visiting this past summer with my sons Emerson and Alistair was a very different experience – shopping for high-end chocolates and watches, spending a day at the Evian spa – but many of the city’s chief pleasures remain the same. The historic downtown is very walkable, and the wind on the lake makes for excellent sailing. The nearby village of Rolle is home to the summer campus of Le Rosey boarding school. Our children often spend several weeks here at summer school, while Terry and I are traveling on our own. The kids don’t think of it as school at all – it’s much more like camp. 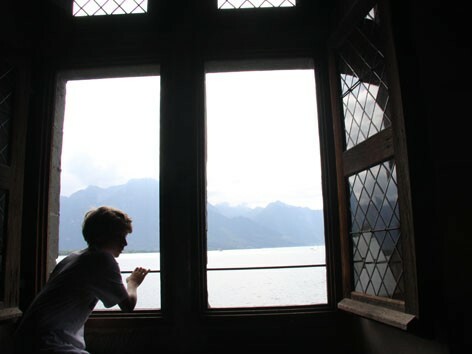 The boys actually introduced me to some of the area’s highlights, such as the Les Diablerets glacier (which offers downhill skiing in summer) and Château de Chillon, an enchanting medieval castle at Lake Geneva’s eastern tip. The Château, along with the town of Montreux and the village of Gruyere, made a great day trip from Geneva. The Geneva airport is very centrally located, making it a convenient gateway to Europe. Next time you’re passing through, it’s well worth spending a few days experiencing Geneva’s culture, history, and spectacular scenery. The boys and I certainly enjoyed it.